This easy enchilada casserole is cooked in the slow cooker. 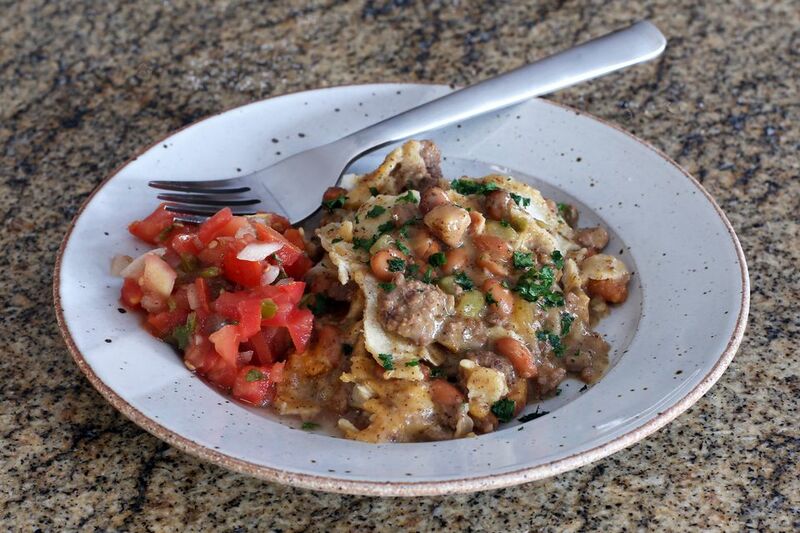 The beef and bean mixture is layered with shredded cheese and corn tortillas. Feel free to use flour tortillas in the dish. This dish is a great choice for a busy day because it's quick, easy, and versatile. You can substitute a different condensed soup in the dish, add corn, use a different kind of canned bean, or vary the seasonings. Add some fresh garlic or garlic powder or add some taco seasoning. Your family will love the dish. Take it along to a potluck supper or tailgating party. Garnish the dish with some fresh chopped cilantro, a dollop of sour cream, and sliced green onions. Or serve with a spoonful of fresh salsa or diced tomatoes. In a large skillet over medium heat, cook the ground beef with the chopped onions, stirring, until the beef is no longer pink. Drain the ground beef and discard excess grease. To the ground beef add the two condensed soups, the diced green chile peppers, chili powder, cumin, drained pinto beans, and water. Spoon some of the ground beef and bean mixture into the bottom of the slow cooker. Layer with some tortillas and then add more ground beef mixture, shredded cheese, and tortillas. Repeat layers until all of the ingredients are used. Amounts and the number of layers might vary depending on the size or dimensions of your slow cooker. Cover and cook on low for 3 1/2 to 5 hours. Replace the corn tortillas with flour tortillas, or layer the casserole with tortilla chips. Add 1/2 teaspoon of garlic or 1 or 2 minced garlic cloves. Add extra green chile pepper or add a tablespoon or two of minced jalapeno peppers. Stir 1/4 to 1/2 teaspoon of cayenne pepper into the sauce mixture. Replace one of the condensed soups with cheddar cheese soup or cream of celery soup. Or use a nacho cheese soup in place of one of them. Use shredded Mexican blend of cheeses, pepper jack, or taco-seasoned cheese.